Amidst all the injuries the Packers are dealing with, they’re actually starting to get healthier at some spots, which “encouraged” Head Coach Mike McCarthy. RB James Starks (knee) returned to practice on Wednesday and was listed as a full participant, though it was a non-padded practice. Starks has been out since injuring his knee in the first half at Cincinnati in Week 3. Also listed as full participants were three players with hamstring injuries — LB Brad Jones, CB Jarrett Bush and CB Casey Hayward. McCarthy said Jones is being “eased” back into things, but this marks the second straight week Hayward has practiced on Wednesday and appears on track to work every day. Hayward has yet to play this season after missing all but three practices in training camp. McCarthy didn’t have anything new to report on TE Jermichael Finley, who is seeking opinions from multiple specialists regarding his neck injury and his future outlook. Finley remains in a local hospital but continues to improve. 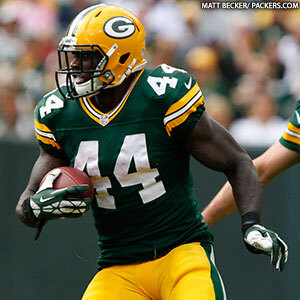 For the full report from the Packers’ locker room on Wednesday, click here.